Always a pleasure to run in London and have done for a few years now. A great introduction to Cross Country and on a good day the ability to get some speed-work in. Both our team managers work paid off with us having five complete Belles teams and 3 were in the top 10. With the short 3km lap on an almost flat grassland course, this event suits middle distance track runners happy to supplement the usual distance crowd but the turnout this year was our biggest. Medals have frequently been won too, but we haven’t actually won since 2012 which was the team I was part of but always aim to medal. Saron leading the field by almost 30 seconds and handing over to me with a lead to try to keep around the course. For me I surprised myself and ran quicker than expected. It wasn’t too far off my best a few years ago having run a sub 12 minutes and today I ran a fine 12:03. Handing over to my then team mate Katie she had the unenviable task of bringing our A team home being chased by International Pippa Woolven of Wycombe and 2;01 800m runner Katie Snowdon of Herne Hill. The lead was just not enough for her and we ended up with a credible bronze from a fantastic battle in South of England. 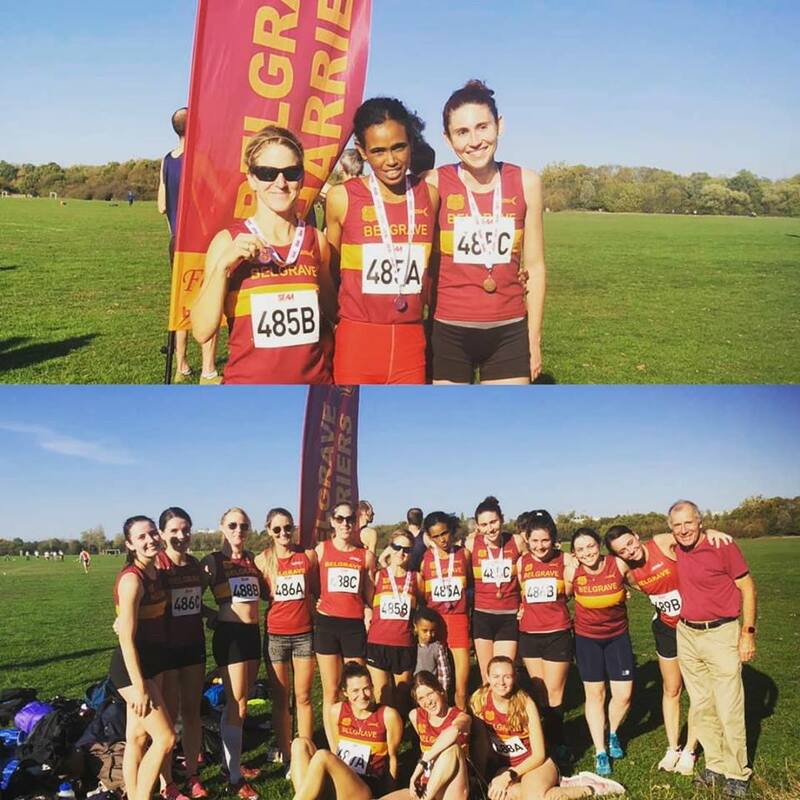 1 Wycombe 34:48; 2 Herne Hill 35:11; 3 Belgrave A 35:22 (S Haileselase 11:11; S Amend 12:03; K-E French 12:08)… 9 Belgrave B 37:52 (E Howsham 12:33; J Leverticiute 13:12; G Fenn 12:07); 10. Belgrave C 38:17 (K Mackenzie 12:23; M. Hall 12:47; S Hewitt 13:07); 17 Belgrave D 40:31 (L Goldie-Scot 14:06; F Maddocks 12:59; R O’ Brien 13:27); 24 Belgrave E 43:09 (M Corden-Lloyd 13:22; M McDonald 15:35; M Corden-Lloyd 14:12).